This was suggested by a friend, who assured me that if I came to her rowing club on a Saturday morning, I could be assured of exiting my comfort zone, in a good way. I assumed from that that it would be a thoroughly good work out. I was up for that. And indeed genuinely interested, I was actually thinking that rowing might be something I took up, for more than the one session. The reality was anything but what I expected. For starters, my internet search, it turned out, referred me to the wrong rowing club. I didn’t realise until I checked the website a few minutes before leaving for the session. By then I had committed, via an email exchange with the membership secretary. 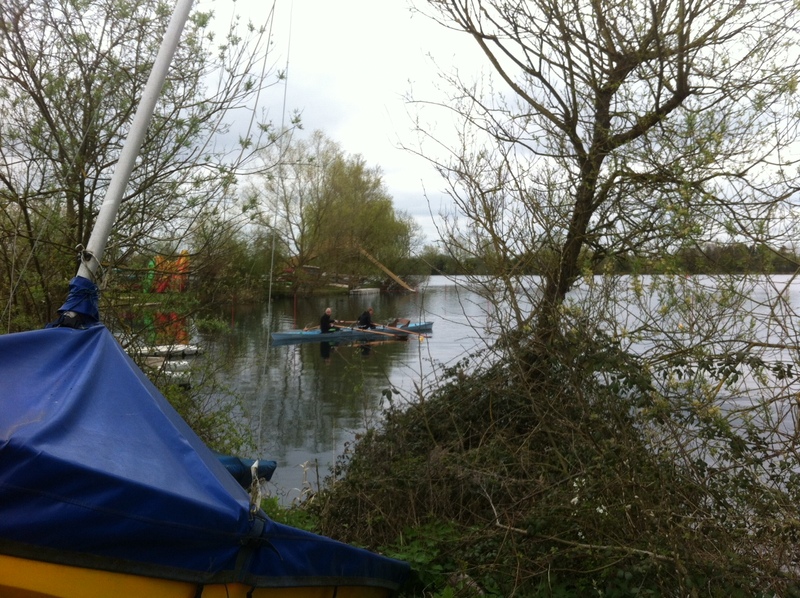 So I found myself on one of the lakes of Cotswold Water Park, at 9.45 on a Saturday morning, looking for signs of the rowing club. I asked a chap who was hanging around some boats, and he identified himself as the club captain. What a stroke of luck. Then I met the membership secretary, with whom I had corresponded. Then I met the Chairman! The big names were all in evidence. Everyone was friendly, though perhaps somewhat male, and aged. I looked in all directions for the rest of the membership. There was no sign. We chatted of this and that, and the gentlemen introduced me to their various boats. They explained the learning process, and all manner of terminology. A plan for my session was formed. In the end though I had to ask, ‘Does anyone else come?’ They rattled off a handful of names (all male). At its height, apparently, this club had as many as 12 members! Several however were sighted but rarely. And a couple of them were sufficiently advanced in years that they did not often take to a vessel these days. I had imagined an assortment of lively folk, my friend among them, all sharing boats and organising themselves into 4s and 8s, a cacophony of boating enthusiasm to get caught up in. Instead, I was emptying water out of a rusty looking tub with 2 old men. I also hadn’t really imagined that rowing would be very difficult. I don’t know why. I thought that the challenge of it was that it was hard physical work, and perhaps it was tricky to keep in time with the other rowers. It had never occurred to me that there was a skill to be learnt in actual rowing technique, or in keeping the boat upright. Yet there I was, sitting in a boat that a tsunami couldn’t capsize, with one-on-one instruction for an hour and a half, and I still couldn’t get the movements right. Oh dear. If I actually got in a proper rowing boat I’d be in the water in seconds. Thankfully that wasn’t on the cards for my first session. I was relieved and surprised that it didn’t involve getting wet at all. I wore the same kit that I wear biking! And that was fine. But it was still a bit cold once we were out in the middle of the lake. It was all really very surprising. Rather less fun than I expected in truth, less people, less banter, more difficulty, and far more of a learning curve if I did decide to take it up. And yet astonishing generosity from the people I did meet – the chap I went out with spent the whole morning doing nothing but tutor me, with no agenda other than to help. Once again I am astonished at strangers’ generosity in helping me to do all these random things. But even so, I suspect that that one will remain in the realms of a one-off. Unless I ever do find the right rowing club!